What keeps people from buying an Apple Watch? For some, it's the lack of value associated with it, or the “I wouldn't use it anyway” mentality. For others, it's the price tag involved. But in Taiwan, consumers are about to see the full force of an Apple Watch price tag thanks to the release of the most luxurious breed of Apple Watch out there, a model valued at more than many used cars. There will be a range of prices on hand for Apple Watches in Taiwan, reports note, thanks to a range of devices available for users to pick from. A simple sports series comes in at the lowest cost, with a price around $323, to a price up to $16,163 for the Apple Watch Edition. That premium edition does include some ritzy features, including a crafted custom rose or yellow 18-karat gold, which Apple's metallurgists note is “twice as hard as standard gold.” A sapphire crystal display and a unique band round out some of the extra benefits involved. Reports suggest that Taiwan will be exposed to the full range of options, and out at the Studio A branch at the Taipei 101 Mall, all 54 separate versions will be on display, including the top of the line model. The Apple Watch releases will be separated into three classes, reports note, including the Apple Watch Sport, the Apple Watch, and the Apple Watch Edition. Taiwan is actually part of the second batch of countries to see the Apple Watch arrive, and joins such locations as Spain and Mexico, as well as Italy and Switzerland in Europe and Singapore and South Korea. This graduated release schedule likely came about so as to give Apple some time to have new units made up while selling through the first burst of countries. While it might be a stretch for some to ever imagine dropping $16,000 and change on a smartwatch, it's really only out of line in the subjective sense. 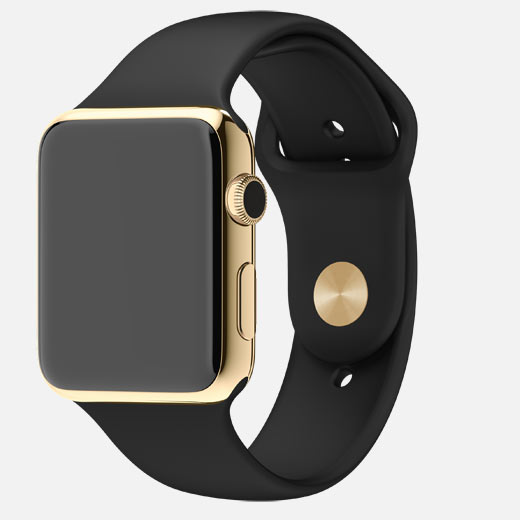 After all, a smartwatch that's decked out in any quantity of 18 karat gold has a certain cachet over its cohorts. Most people won't be that interested, of course, but for those who want to really make an Apple Watch into a status symbol, having the highest-end version complete with the gold and crystals will fall right into line. That's the key thing about wearable technology; the actual technology part is just half the equation. The “wearable” part of wearable tech both allows for and ultimately requires that myriad aesthetics be recognized and incorporated into the devices. If the device looks great but does nothing, it won't reach its full market potential. The reverse is true as well; it can do everything but look terrible and it won't be well-received either. With Apple, though, there are plenty of options, and from the simple to the elaborate, there won't be any wanting for style. Taiwan and a bunch of other countries are about to get a look at that much first hand.